As the urban landscape expands upward and outward, and space becomes an increasingly pricey commodity, stylistic compromises have to be made… or do they? 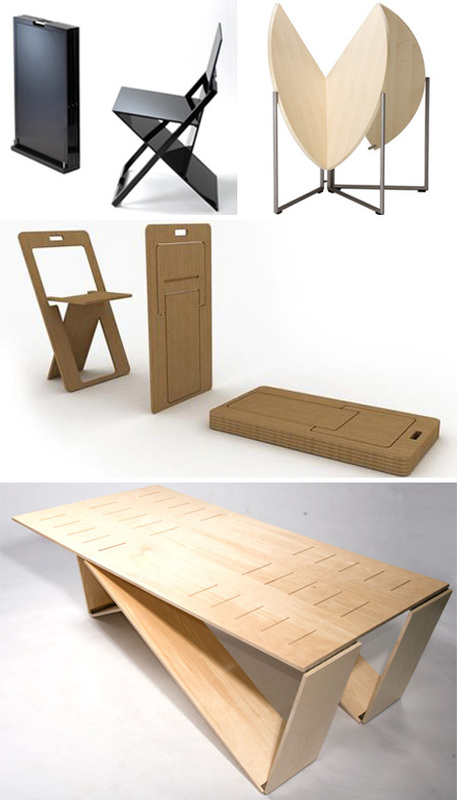 Beautiful furniture designs are cropping up out of the need to save space. 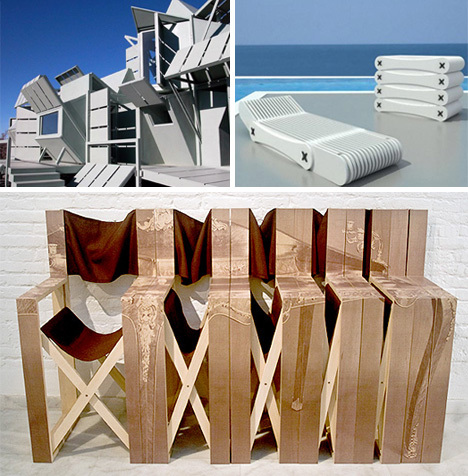 Daniel Milchtein Peltsverger’s Biombo Chairs turn from simple room dividers into fully functioning chairs for guests. Some creative interior designers came up with a nifty idea to create a living room that can be shifted around at a moment’s notice. Michael Jantzen created an incredible pavilion (called M-house) that can fold and unfold in a thousand different combinations. MIT’s CityCar is an experiment in the future of city transport. 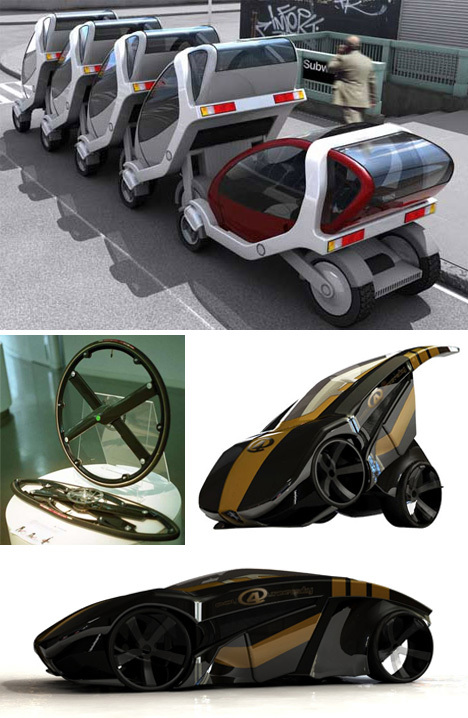 Designer Daniel Bailey went a step further when he created the BRB Evolution concept car to tackle the lack of space in future cities, while keeping the cars cool. Ever tried to get a bike into a car? Anyone who says “yes” knows that the wheels are the biggest problem. No longer! Inventor Duncan Fitzimmons has designed a wheel that is strong enough to support a rider, but can collapse into almost nothing. Stack those chairs away for another day! Bloomframe is a window that can turn into a fully-functioning balcony at the touch of a button. Need a small office? 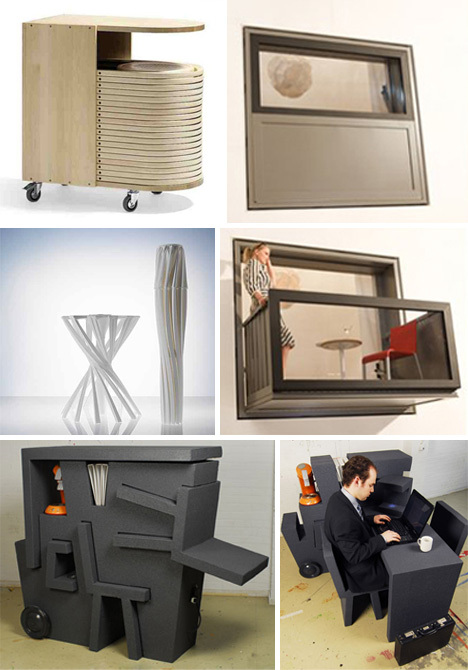 Kruikantoor by Tim Vinke is an entire office that can be carted anywhere. With a simple twist, the One Shot by MGX turns from a side table into something the size of a folded up umbrella. Ready to move? Simply let this accordion bookshelf collapse down on itself. For everyday use, Eeva Lithovius created incredibly handy modular shelves that look great folded up, or down, and can accommodate nearly any mix of books or odds & ends. 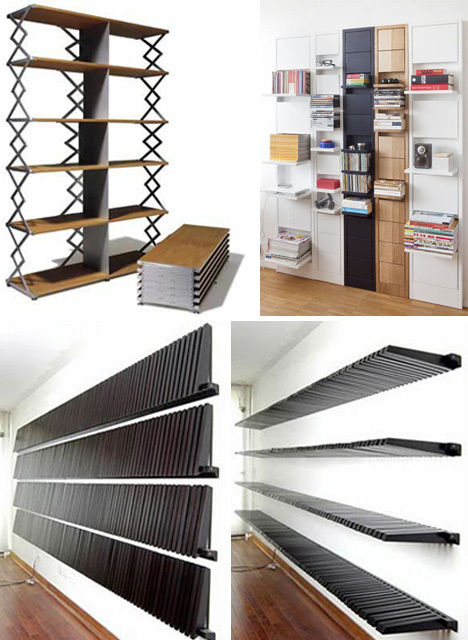 There are some variations on this design, such as a lengthy set of shelves made entirely of folding rods. Yoann Design’s Codex collection has a wild aesthetic, with gorgeous patio furniture that can also be put away at a moment’s notice. A small table for two that would be super handy for a quick picnic outside. Sun? No sun? An adjustable canopy is a must during the summer. 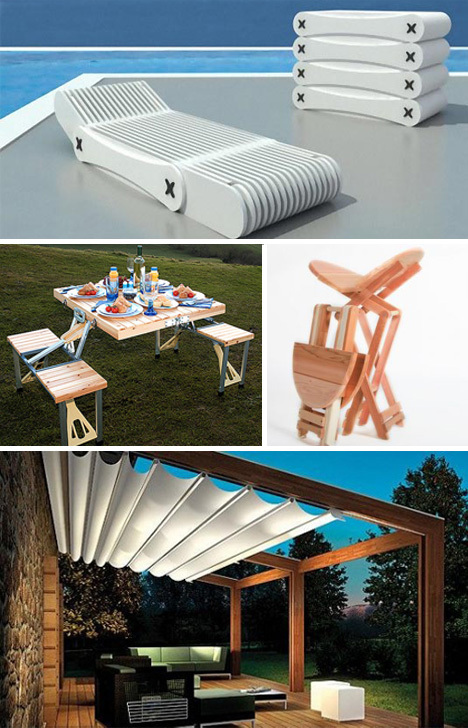 Most of the time picnic tables are not in use, so save valuable backyard space with a table that can fold up and be placed into a shed. Designer Jake Phipps came up with a sleek black chair that can fit anywhere and Nils Frederking follows suit with a table that twirls into almost nothing. Ufuk Keskin has created a chair that can be hung on the wall, while Brainstream Design realized that a table is typically one of the largest pieces of furniture, so why not dream small with something big? Designer Mr. Simon has created a gorgeous space saver with his sideways accordion director’s chairs. Reinier De Jong’s accordion chair may not be the most comfortable piece of furniture, but it’s definitely space-saving. That’s what cushions are for, right? 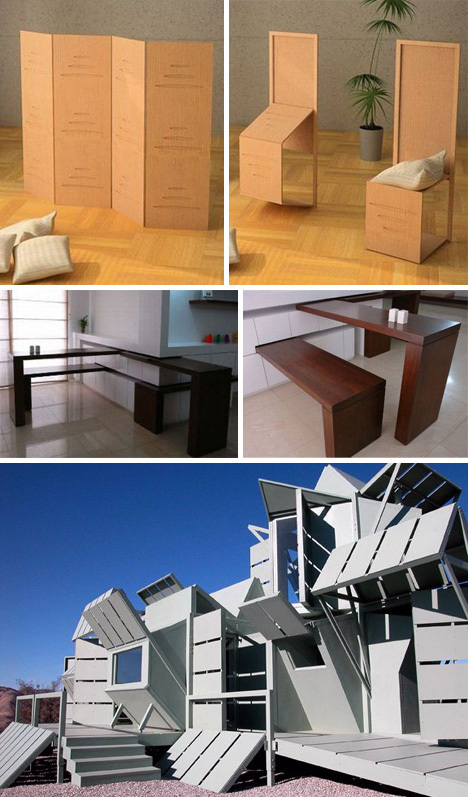 Ming Tang has taken the concept to another level, by coming up with the concept for entire structures that can fold in on themselves. 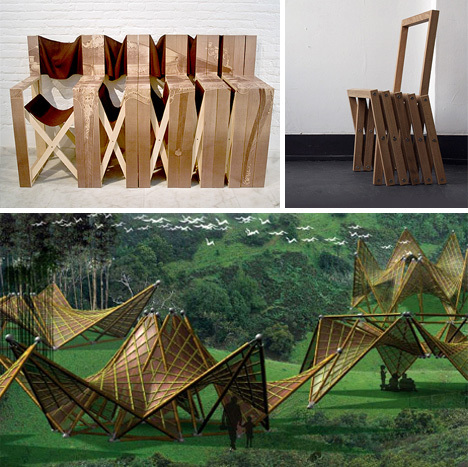 Made out of durable bamboo, they could serve as temporary shelters during emergencies.